It’s been a while since I last reviewed a lipstick, so I figured now would be a good time to! I was actually supposed to put this post up on Valentine’s Day, but work got in the way and I just couldn’t find the time to sit myself down long enough to write. I bet you’re wondering why I was going to blog specifically on Valentine’s Day, right? Well, there’s good reason because I’m reviewing Happy Skin’s newest product, their Shut Up And Kiss Me lipstick in the limited edition shade "Valentine Kiss" (Php549.00)! This the brand’s first ever collaboration for a product, and it’s with local celebrity, actress, and host, Kris Aquino, who asked them to create a special lipstick. 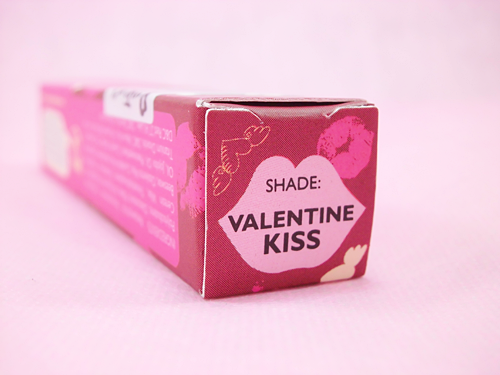 Since Kris is a Happy Skin fan herself, and with pink as her favorite color, Valentine Kiss came to be! Product description: This lippie offers three-fold “lip service”: the shine of a gloss, the pigment of a lipstick, and hydration of a balm! Spoil yourself with Shea Butter & Collagen to keep your lips in lip-lockin’ shape! Whether single, settled, or searching, kissable lips are the best valentine date! Kris wants you to channel love while keeping your smacker ready for smooches. 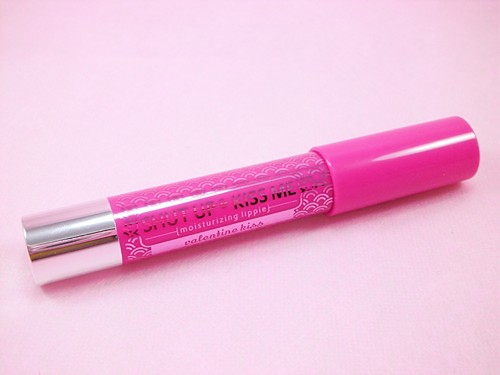 Pucker up perfectly this Valentine’s with Happy Skin Shut Up & Kiss Me Moisturizing Lippie. The pretty pink shade VALENTINE KISS instantly brightens the face, complementing your features with an ultra-kissable lip. Lightweight and moisturizing, this lippie glides on smoothly and stays through me-time adventures or romantic rendezvous. I can’t help but adore the new packaging just for this product. It’s similar to their regular, Shut Up And Kiss Me lipstick boxes except this is definitely decked out for Valentine’s with the pink and red color scheme, as well as the hearts and kiss marks everywhere. Honestly, I find that Happy Skin is one of the small handful of local brands that really dedicate themselves to packaging design and quality. 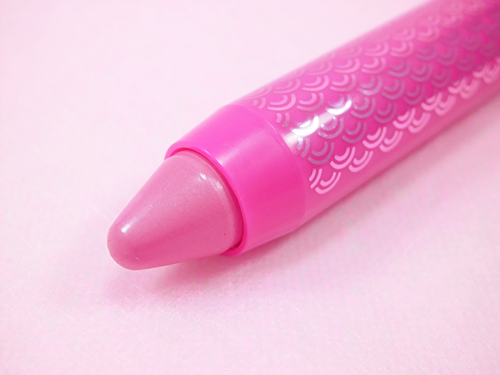 Okay, so how ridiculously cute is this lippie? I’m head over heels myself for that metallic sheen combined with the bright pink. Again, it’s similar to their regular lipsticks except for the metallic finish. You get 2.7 grams of product which I think is good, especially considering your regular ol’ MAC lipstick is 3 grams and locally, this is almost half the price of a MAC lipstick. Regarding the shade, Kris says “It’s a youthful, happy pink and not bubblegum-ish!” Just by looking at it I can already agree that it doesn’t really look like your typical bubblegum-like shade, but it still is…well, very bubblegum-ish. Not that that’s a bad thing, of course! 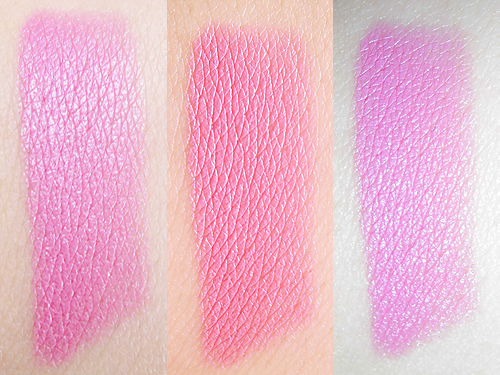 Anyway, you’ll see for yourself with the swatches below. The texture of the lippie is really smooth, creamy, and it practically glides on when you apply it. Not surprising though considering it has ingredients like Shea butter, Aloe oil, and Jojoba oil. 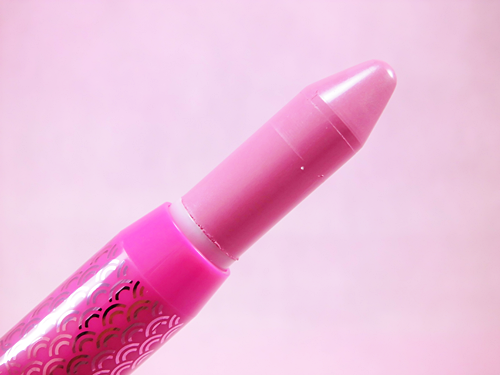 When they say this is a moisturizing lipstick, they mean it! I can even easily apply this onto somewhat dry lips without needing to prep with a lip balm. However, if your lips are really dry (and flakey) like mine naturally are, you will have to do some lip exfoliation first and use a balm or else it’ll cling onto any dry patches and flakes. I find the lipstick is also very buildable. You can get a subtle, sheer layer of pink if you just run it along your top and bottom lip once and then rub and smack your lips together. I like it more intense though so I swipe it at least 2-3 times on each lip. The swatches above are 2 layers. I can compare the wear time to an ordinary lipstick. It’ll survive light snacking and some drinking, but don’t expect it to pull through heavier meals, especially with oily foods, and if you lick your lips a lot while eating like I do. Haha. I like how it fades away gradually though, and not as a blotchy mess like with some other lippies. Overall, I really like this lipstick and it’s easily become one of my ultimate favorites. You could say it was love at first swipe! Almost everything from the shade, to its moisturizing properties, to its finish just scores major points with me. I feel like it compliments my skin tone too and it really does brighten my complexion, so much so that sometimes I feel like I don’t need blush anymore to achieve that. I’m actually already considering getting myself another one before this runs out for good! I’ve got my fingers crossed Happy Skin releases more gorgeous, limited edition shades like this in the future or adds to their current Shut Up And Kiss Me line because I’d be more than eager to try (and buy) them all out. The super girly and cute packaging. Moisturizes the lips and keeps them soft and hydrated. Doesn’t feather or bleed, so no need for a lip primer or lip liner. It can cling onto or emphasize any dry patches and flakes if you don’t prep your lips properly, but then again, the same applies to most other lipsticks. If you want to find out more about Happy Skin and their products, check out happyskincosmetics.com and like and follow @happyskin_ph on Instagram and Twitter.